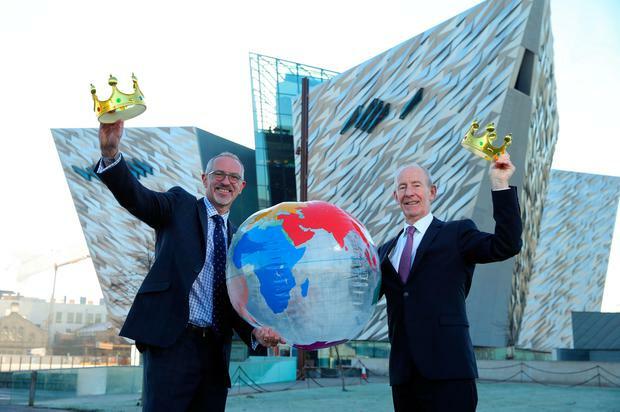 Titanic Belfast CEO Tim Husbands MBE and Vice Chairman Conal Harvey celebrate as Titanic Belfast is named ‘King of the World’ at the World Travel Awards. 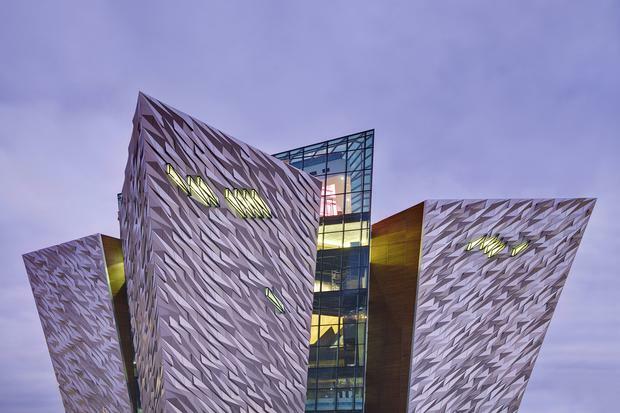 Titanic Belfast has been crowned 'World's Leading Tourist Attraction' at the World Travel Awards 2016. This is the first time the accolade has been won from Ireland. Titanic Belfast beat off stiff competition from eight global finalists, including Ferrari World Abu Dhabi, the Las Vegas Strip, Machu Picchu to win the top gong. Dublin's Guinness Storehouse was another global finalist. The World Travel Awards, now in their 23rd year, are decided by open vote and widely hailed as 'the Oscars of the travel industry'. Over one million votes were cast from over 216 countries in the red-carpet awards, held at Sun Siyam Iru Fushi resort in the Maldives this week. "Over the past few years, we have continued to go from strength to strength but to be voted the World’s Leading Tourist Attraction by both the industry and the public for excellence in tourism and our original product, is really the jewel in our crown," said Conal Harvey, Titanic Belfast’s Executive Vice-Chairman. “We always knew that in Titanic Belfast, we were home to a world class attraction that would become a global brand," said Northern Ireland's First Minister, Arlene Foster. “This is terrific news for Titanic Belfast and will help in our global pitch to make the north of Ireland one of the world’s top tourism destinations." Titanic Belfast had already beaten off the Colosseum in Rome and the Eiffel Tower in Paris, among other attractions, to win Europe's Leading Tourist Attraction. The iconic attraction opened in 2012, and this summer welcomed its three millionth visitor. Queen Elizabeth, Hillary Clinton and Titanic director James Cameron are among the celebrities to have paid it a visit.